All this television chatter about Jay Leno’s primetime failure and subsequent return to late night by supplanting Conan O’Brien‘s current slot got me to thinking. There’s an “I’m With Coco” movement afoot for those folks supporting the carrot-topped (but not that Carrot Top) tv host. O’Brien has opted to put his foot down and refuse to move. 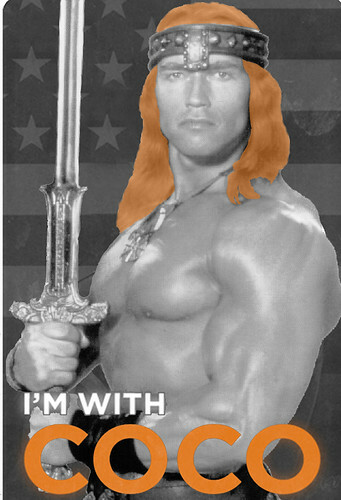 Talk all you want about that Conan, but I’m rooting for a different Conan. The original Conan – The Barbarian. The real deal who would smite down Leno with one deft swoop of his sword. “The Chin” would fall in a heap at this Conan’s feet. Gawker has a round-up of all the late night hosts and their Leno bashing. Treasure maps are so last century. According to the Telegraph, an LA man has now used the Internet and Google Earth to find a shipwreck that he claims is filled with silver and gold. The location of the swamped Spanish ship is somewhere along the coast of Texas. He is suing for the right to dig up what he believes is his treasure. If you aren’t into sunken ships, Urlesque has the top 10 views captured by Google Street Maps, including passed out drunks, rescued kitties and bicycle accidents. There are more unusual Street view captures at the Google Street View Gallery. And here are some videos mocking Google’s invasive in your neighborhood vibe. Where’s the Bread and Milk?!?!? So we’ve had a little ice come down in our neck of the woods. 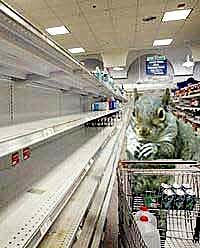 Of course, this means rampaging shoppers have wiped out all the bread and milk in area stores. I wonder what the lactose intolerant shop for on these days? Thank goodness the crazy ladies were too busy buying staples to nab all the beer. I got this in my e-mail from my aunt. Thought it was funny and wanted to share it. I AM MINISTRY OF THE TREASURY OF THE REPUBLIC OF AMERICA. MY COUNTRY HAS HAD CRISIS THAT HAS CAUSED NEED FOR LARGE TRANSFER OF FUNDS OF 700 BILLION OF YOUR DOLLARS (US). IF YOU WOULD ASSIST ME IN THIS TRANSFER IT WOULD BE MOST PROFITABLE TO YOU. I AM ALSO WORKING WITH HIGHLY REPUTABLE MR. BARNEY FRANK, MEMBER OF CONGRESS FROM PEOPLE’S REPUBLIC OF MASSACHUSETTS, WHO WILL BE MY REPLACEMENT AS MINISTRY OF THE TREASURY IN JANUARY IF OTHER POLITICAL PARTY, LED BY MR. BARACK OBAMA, WIN UPCOMING ELECTION, WHICH HE CERTAINLY WILL BECAUSE HE IS IN CONTROLLING OF VOTING IN ILLINOIS, OHIO, FLORIDA, AND MANY OTHER STATES. MR. BARNEY FRANK IS VERY KNOWLEDGEABLE ABOUT FINANCIAL TRANSACTIONS OF ALL KINDS, AND FAITHFULLY TEACHES PRECEPTS OF MR. BARACK OBAMA (“FROM TINY A.C.O.R.N. GROWS GIANT FORECLOSURE OAK!”). THIS TRANSACTIN IS 100% SAFE. YOU MUST TRUST ME COMPLETELY AND NOT ASK QUESTIONS ABOUT THE TRANSACTION. YOU HAVE MY WORD NO ONE WILL DO ANYTHING WRONG WITH THE MONEY. THIS IS A MATTER OF GREAT URGENCY. WE NEED YOUR BLANK CHECK. WE NEED THE FUNDS AS QUICKLY AS POSSIBLE. WE CANNOT DIRECTLY TRANSFER THESE FUNDS IN THE NAMES OF OUR CLOSE FRIENDS BECAUSE WE ARE CONSTANTLY UNDER SURVEILLANCE. MY FAMILY LAWYER ADVISED ME THAT I SHOULD LOOK FOR A RELIABLE AND TRUSTWORTH PERSONAGE WHO WILL ACT AS A NEXT OF KIN SO THE FUNDS CAN BE TRANSFERRED. I want my share of the $700 billion bailout just like everybody else, but how will Treasury Secretary Henry Paulson know about the bills I need to pay off unless I send them to him.